Food writer James Oseland is the current editor-in-chief of Saveur and is also a former James Beard Award winning cookbook author, notably for his 2006 collection of recipes found in Cradle Of Flavor. The cookbook was hailed as one of the best books of the year by The New York Times among many other publications. His latest cookbook, The New Comfort Food: Home Cooking from Around the World, aims to impress just as much. In The New Comfort Food, Oseland draws attention to 100 recipes that are comfort food staples in different cultures. It's also a cookbook for food history buffs, since the recipes are often traced back to their roots and presented in pure form. 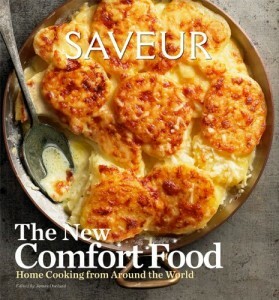 Fans of Saveur will appreciate the similar writing style, from "the archetypal family meal" of lasagna to the "veritable birthright" of catfish -- pages of descriptive prose await readers who peruse cookbooks for the text as well as the recipes inside. American comfort foods such as grilled cheese sandwiches and macaroni and cheese appear amongst global comforts like huevos rancheros, empanadas from Argentina, Thai green beans, udon noodles, and French salads. For a sneak peek, the recipe for Thai Green Beans with Basil can be found here.